Thomas Mann Randolph, Jr. was married to Thomas Jefferson’s oldest daugher, Martha. Thomas Jefferson’s mother had been a Randolph, and Martha and Thomas Mann Randolph were cousins some degree removed. 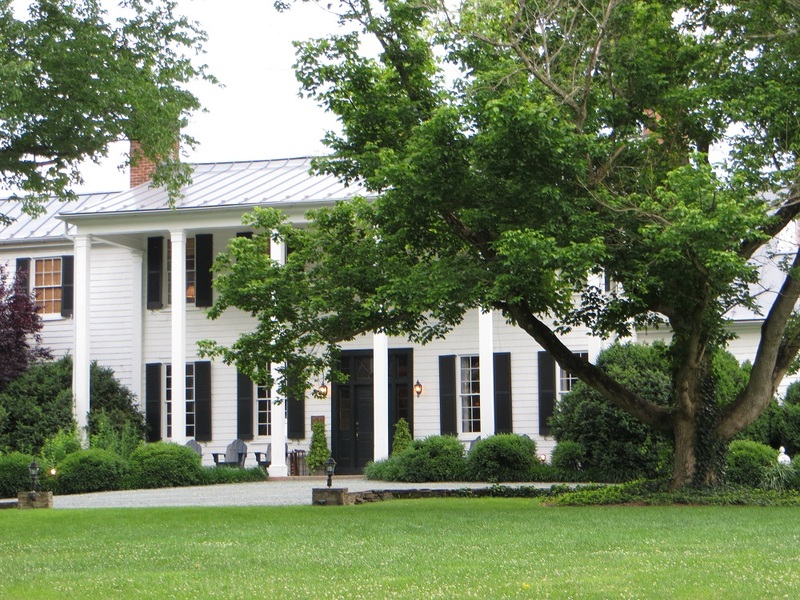 They married in 1790 and lived at Edgehill, Randolph property within sight of Monticello. In 1799, Thomas Randolph and some business partners decided to build a port (which never came to fruition) next to the Rivanna River, just slightly further away from Monticello. He built an office there, on property that would eventually be named Clifton by later owners. It would become his refuge from the Jeffersons. He also built a warehouse, which he would eventually turn into his residence. The Randolph’s eldest son sold the property in 1830 and it went through several (15, according to the Clifton website) owners before being bought by the current owners in 1983. Clifton now is a country inn and restaurant and part of the Relais and Chateaux collection of luxury hotels. It’s actually my favorite Charlottesville hotel and where I’ve always stayed when in the area in the past. I decided to stray a little this time, because I didn’t have a dog with me (Clifton is dog-friendly) and had more options. I’m glad that I got the city experience with 200 South Street (which really was terrific), but I think it’ll be back to Clifton from here on out. Althought we weren’t staying, we decided to try the restaurant. I’d never been, since it hadn’t existed the last time I was in Charlottesville. The dining area was an enclosed porch on the back of the house (sad that my photo didn’t come out). There also was outdoor seating and a smaller, formal dining room that was occupied by a private group the evening we were there. From where we were sitting, we could see that there’s a chef’s table in the kitchen. Clifton serves a tasting menu — small portions of multiple dishes. Non-Spanish tapas. We had a choice between a four plate meal and a five plate meal (although I’m sure that they’ll let you keep eating if you’re still hungry after 5) and we chose the four. My strategy was to choose items that contained at least one unfamiliar ingredient — not difficult on Clifton’s rather eclectic menu. The choices are divided into four categories: delicate, light, full-bodied and robust. Everything we ordered was delicate or light. We started with an amuse from the chef: salmon tartar. I’m a big sashimi fan, so it made me happy. Dish 1: Seared scallops with soy milk and potato cream, seaweed butter, pickled cucumber and beets. Unfamiliar item: seaweed butter. 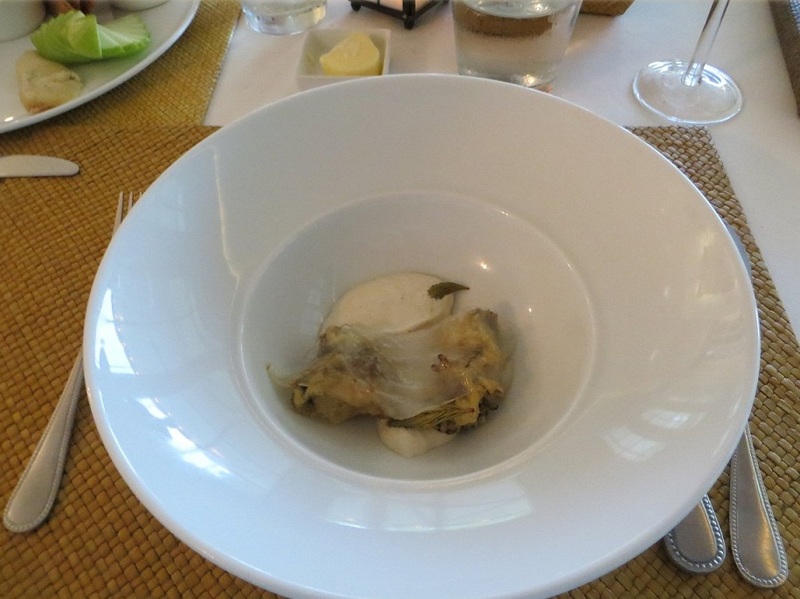 What seaweed butter tasted like: couldn’t tell. Dish 2: House made tofu with tempura hen of the woods mushrooms, pickled spruce tips and lardo. Unfamiliar item: pickled spruce tips. What pickled spruce tips tasted like: crispy twigs. Dish 3: The Virginia cheese platter — three sheep and two cow . Nothing unfamiliar about cheese, but I couldn’t resist. Dish 4: Sticky toffee pudding with cinamon ice cream, candied pecans and medjool dates. The cheese platter did me in and I was too stuffed to get all the way through my pudding. And believe me, I tried. My husband, an extra large guy, might need more food. But I think that if he chose from the full-bodied and robust list (full of ham, lamb, and ribeye), he’d have more than enough. Thomas Mann Randolph Jr’s life didn’t go well. Somewhere along the line, he became an alcoholic and abusive, and by the time Jefferson left the presidency, Randolph and Martha were separated. Jefferson retired to Monticello and Martha and her children (they had 12, 11 of whom survived to adulthood) went to live with him. Randolph holed up at Clifton. He and Martha eventually reconciled and in March of 1828, he moved into the North Pavillion at Monticello. He died there four months later. Gallery | This entry was posted in Virginia and tagged Charlottesville, historic hotel, historic house, history, history travel, Martha Jefferson Randolph, restaurant, Thomas Jefferson, Thomas Mann Randolph Jr.. Bookmark the permalink. Really interesting menus, impressive they have a vegan one too. Looks like very inventive cuisine, I’d not heard of half of those ingredients (ok cheese maybe). I don’t like dessert but your pic looks wonderful – I have had sticky toffee pudding, maybe it’s a Brit thing. I’ve always tried to stay in dog-friendly places whether I’ve had them with me or not, just to support the principle. And look at that pool!! Yes they do have a vegan menu — a very good one, too. And sticky toffee pudding definitely is a British thing, but making its way to the States. I kind of feel guilty about abandoning Clifton when they’ve been so kind in the past…. The biggest surprise for me was how much I liked the salmon tartar! Maybe there’s hope for me yet! Starting to feel a little guilty about dissing Tom Randolph all these years as a loser. I would have a seriously hard time maintaining a relationship with a spouse who continually preferred a parent to me. I’d like to read more about Thomas Randolph — always interested in people with psychological issues.